Happy almost Valentines Day, y'all. Yeah, yeah...it's a lame holiday and one that I hate celebrating regardless of my relationship status. But you know what does make me happy? 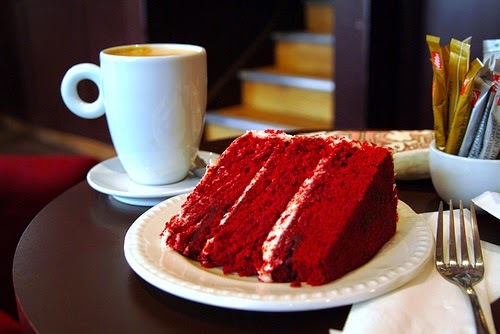 Red freakin' velvet cake! Growing up, my southern mother used to make the delicious treat every year for Valentines Day - so it has now become tradition. Other people dig into a box of chocolates or "sweet tarts" candy...I simply must have at least one slice of red velvet cake every Feb. 14. I still love the high-cal version, but I was thrilled to discover a sugar-free version a few years ago that was almost as delicious. And now it appears there are a few different low-cal recipes available, so I will definitely be whipping up my own batch of red velvet cake this week. A warning to anyone planning to make it for the fist time...prepare to spend some time in the kitchen. And only make it for people worthy of that time and attention. Anyway, I've attached a few recipes below. Any recommendations on which I should make this year?